Illinois National Guard and John Schmale. I have been a life long Civil War buff and am now researching the location of and condition of the Regimental flags from the Civil War Illinois Infantry, Artillery and Cavalry regiments. In addition to those deteriorating in the Hall of Flags, Centennial Building in Springfield [Illinois] I have discovered there are many other battle flags in Court Houses, Historical Societies and private hands all over the State. The flags not held by the State are those that were brought home by a member of the Regiment and turned over to the local GAR [Grand Army of the Republic, organization for veterans of the Union army]. When the various GAR posts closed, the flags often went to the local court house or into private hands. I'm sure many were destroyed. Unfortunately, many of the flags that still exist are not being maintained and are literally falling apart. Since most were silk, many flags simply disintigrated into dust. I hope to be able to photograph as many of these flags as I can over the next year. There are great stories behind many of these flags-probably enough to fill a book. 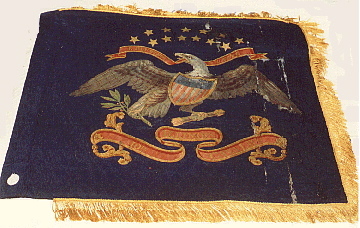 The US Army Regulations called for each Regiment to have "two silken colors. The first, or the national color, of stars and stripe; the name and number of the regiment to be embroidered with silver on the centre stripe. The second, or regimental color, to be blue, with the arms of the United States embroidered in silk on the centre. The name of the regiment in a scroll, underneath the eagle. The size of each color to be six feet six inches fly, and six feet deep on the pike. The length of the pike, including the spear and ferrule, to be nine feet ten inches. The fringe yellow; cords and tassels, blue and white silk intermixed." It was a great honor to be the color bearer but in battle the mortality rate for color bearers was quite high since the goal of the opposing force was to shoot the color bearer and seize the enemies' colors. John's web site has more information and more images of flags. At the outbreak of the Civil War (1861), the US Flag had a field of 33 stars representing 33 states. President Lincoln refused to remove the stars representing those states which seceded from the Union. From the first 3 months until 1863, the flag had 34 stars. In 1863, West Virginia separated from Virginia to join the Union. Consequently the Union flag had 35 stars until the close of the Civil War.